We strive to not buy a ton of toys, most of what he plays with have been generously gifted to him and if they weren't, well he most likely wouldn't have them. For now, when it comes down to it Gabriel would rather explore outside at any given moment of the day than sit inside and play with toys. Kids are kids though and toys are part of growing up but toys can be purposeful. 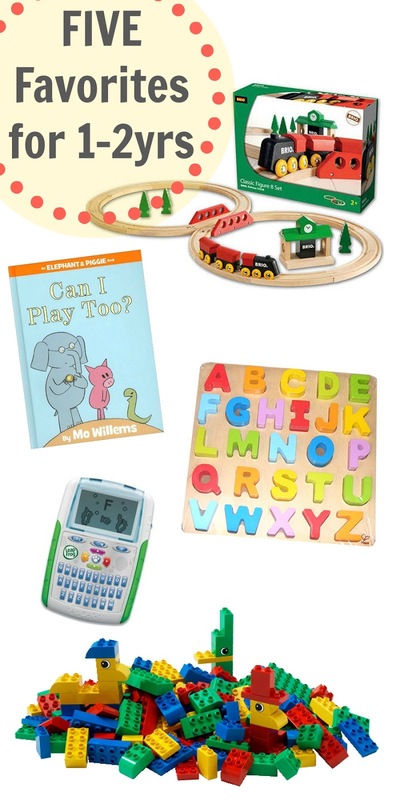 Here are our five favorite toys for 1-2years (and probably passed that but we aren't there yet) and why! Wooden Train Set: First off, wood not plastic means they will last forever and Chris and I have already decided that these puppies are not going to be given to any of the children when they have kids of there own! No, these trains are staying at grandma and grandpa's for the grandchildren (read: Chris secretly but not so secretly bought these for himself because he loves them and didn't have them as a child). It may be the gender, age, or just the fact that we have lived in Japan for more than half his life but Gabriel is OBSESSED with trains! We love watching him use his hand-eye coordination and fine motor skills to put the tracks together and challenge his cognitive ability to make them flow. There are even exploratory learning moments with how the trains connect through the law of magnets; you totally see the little wheels turning in his head when he notices they attract one way and repel the other. Books: Lets be honest, books have been one of Gabriel's favorites since birth and they don't appear to be going anywhere soon, thank goodness! His taste in books has morphed over the last year and a half though. Right now he really enjoys books that he can "read" along with and Mo Willem's books are great for this. Books that have only a few words per page, conversation between characters who give one word responses, and also utilize onomatopoeia are a huge hit because after a few reads he can memorize certain parts of the book and says those parts at the correct time! Reading books then becomes very interactive, lively, and almost plays out like a game for him. Rhyme books or books that have a repeated rhythm to their syntax are also enjoyed because once again he can catch onto the pattern of the repetition. Through out the course of a day we probably spend close to 2 hours reading books which teaches him a vast amount of vocabulary. Puzzles: Gabriel has had access to puzzles since a year old but it wasn't until a year and a half that he really started getting into them! His favorite right now is this alphabet puzzle by Hape. It's more challenging to do than his Melissa and Doug ones plus he enjoys identifying the letters and having us sing the ABCs together. It's great for kids to have multiple ways to be exposed to material thats "needing" to be learned. This puzzle provides a visual, tactile, and audio (when sang by someone else) way to learn the alphabet. LeapFrog Text and Learn: This is Gabriel's "potty toy." When Gabriel is using the toilet he plays on this to pass the time (yes it is regularly sanitized). He loves pressing the letters and having them appear on the screen and be called out. He also likes pointing to a letter, telling me what it is, and then pressing the button to affirm his claim. Like the alphabet puzzle, this has really helped him to begin successfully identifying letters. Legos: Right now we are on the Duplo size (larger than traditional) Legos which Gabriel calls 'le. He always asks for help when sitting and playing but when he says 'help' he actually means he wants you to play too. Legos have actually lead Gabriel to start learning color names. We talk about colors when we play and then that transitions to other parts of the day when we are making observations. Much like building train tracks playing with Legos challenges and helps develop his hand-eye coordination and fine motor skills. Of course this isn't all that he plays with but these seem to be the staples for now. What were some of your favorite toys for this age range? I think quite a few of these are going to last you several more years! It's great that you are starting letters already!